Nikola Tesla – Inventor of the modern alternating current electricity supply system. Michael Faraday – Scientist who contributed to the fields of electromagnetism and electrochemistry. Tesla Motors has a market cap of $26 Billion (4/27/15). I’m guessing the folks at Faraday Bicycles Inc. are hoping some of that old time smart guy magic will rub into their wallets too. Maybe they can cut a deal with Tesla Motors… buy a Tesla and get a Faraday. What is a Faraday bike – well it’s a $3,500 electric bicycle that weighs 39 lbs. 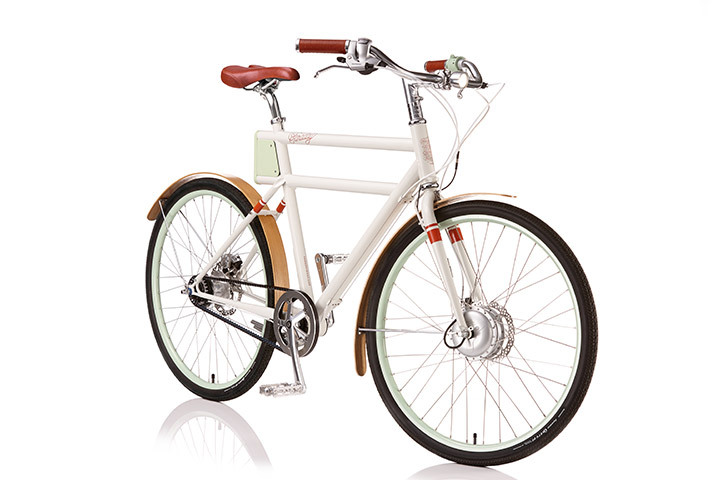 It’s got a steel frame and bamboo fenders. Basically it’s an expensive electric bicycle with a bit of style and an attempt at heritage. The battery which is mounted under the seat provides 20 miles of “pedal assist”. I wish them luck, but it seems like just an overpriced heavy bike. If the bike was say, 20 pounds lighter, you might not need the “pedal assist”. This entry was posted in Such a bargain!, Why did you think this needed a motor? on April 18, 2015 by Gary. It feels like there is a natural price for these electric-assist city bikes, and that price is under $400. If you want to charge $3500, design it as a motorcycle instead.